"The fact you have three freshmen, all candidates to go in the first round and quite high, is unusual because for the past few years most NCAA freshmen are drafted prior to entering college," Director of NHL Central Scouting Dan Marr said. At the 2006 draft in Vancouver, center Toews (University of North Dakota) went No. 3 to the Chicago Blackhawks, right wing Kessel (University of Minnesota) went No. 5 to the Boston Bruins, and defenseman Mitera (University of Michigan) went No. 19 to the Anaheim Ducks. Eichel, a potential top-two pick in the draft, leads the Terriers (6-1-1) in assists (nine), points (15), shots on goal (41) and plus-minus rating (plus-15), and is tied for the team lead with six goals. Hanifin has one goal and four points in 10 games for the Eagles (5-5-0). The youngest college hockey player this season, Werenski has two goals, eight points, a plus-5 rating and team-leading 21 blocked shots in nine games for the Wolverines (4-5-0). The big run on goaltenders at the 2014 NHL Draft in Philadelphia started with the Calgary Flames' selection of Mason McDonald of the Charlottetown Islanders of the Quebec Major Junior Hockey League at No. 34. McDonald (6-foot-4, 178 pounds) was the first goalie taken at the draft and one of five selected in the second round. There were 21 goalies selected during the final six rounds of the draft after no goalies were chosen in the first round. This year's list of shot blockers might not be as deep, but those at the top are certainly making their case for early consideration. There are four goalies, two from North America and two from Europe, on NHL Central Scouting's players to watch list for November considered to be A-rated prospects or potential first-round candidates. 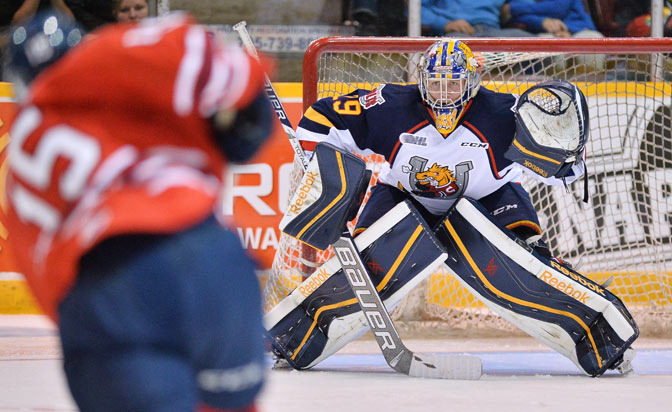 The North American goalies are MacKenzie Blackwood (6-4, 215) of the Barrie Colts in the Ontario Hockey League and Callum Booth (6-3, 199) of the Quebec Remparts in the Quebec Major Junior Hockey League. "Callum is very composed and confident," NHL Central Scouting's goalie expert Al Jensen said. "He has excellent positional play and net coverage and is strong in all areas. He's got great instincts and reads and reacts to plays very well." Booth is 9-6-0 with a 3.04 goals-against average and .904 save percentage in 15 games for the Remparts this season. Blackwood is 6-2-1 with a 3.19 GAA and .910 save percentage in nine games for the Colts. "MacKenzie takes a calm and relaxed approach and has excellent positional play," Jensen said. "He has a butterfly style with great low net coverage and controlled lateral movements." The two A-rated prospects in Europe are Daniel Vladar (6-5, 185) of Kladno in the Czech Republic and Felix Sandstrom (6-2, 191) of Brynas Jr. in Sweden. Players with an A rating on the players to watch list are those the bureau considers to possess first-round ability. Those with a B rating possess second- or third-round potential, and C-rated players are those with fourth-, fifth-, or sixth-round potential. "Releasing a players to watch versus a numerical ranking is what our primary audience, the NHL teams, scouts, Hockey Canada and USA Hockey would like to receive from Central at this stage of the season," Marr said. The Quebec Major Junior Hockey League is churning out better-than-anticipated talent this season, Marr said. The November list identified seven players from the league as A-rated prospects, and there could be a major increase by the time the NHL/CHL Top Prospects Game is held on Jan. 22. "There are more players available in the Quebec league this year than our preliminary list [in September] indicated, and they're all pretty good," Marr said. "Going through the identification phase, we see a lot of second-year draft-eligible players who are on our radar. Some of the B-rated players on the 'Q' list are on the cusp of being A-rated players." The list of A-rated players from the QMJHL includes Charlottetown Islanders teammates Filip Chlapik and Daniel Sprong. "Sprong (6-foot, 189 pounds) compares to Mikkel Boedker; he has blazing speed and a great shot, and has the puck skills and hockey sense to be an effective playmaker," Marr said. "Chlapik (6-1, 194) is a big, rangy center who can power his way to the net. He's got good outside speed and is good down low." Central Scouting tabbed eight players with an A rating from the Ontario Hockey League on its November list, including Erie Otters teammates Connor McDavid and Dylan Strome and Sarnia Sting teammates Pavel Zacha and Nikita Korostelev. McDavid fractured the fifth metacarpal bone in his right hand on Nov. 11 and is expected to be out 5-6 weeks. Otters general manager Sherry Bassin is confident McDavid, who leads the OHL with 51 points (16 goals, 35 assists) in 18 games, will be ready to go for the 2015 IIHF World Junior Championship, which begins Dec. 26. "Injuries are part of the game and we've made it a point, as you recall three years ago when there were so many players out, of adapting here at NHL Central Scouting," Marr said. "We've got a lot of views on Connor McDavid and are very comfortable with ranking him where he is. "Hopefully [the injury] is nothing serious and he'll be back playing and be able to participate with Erie, because they look like they've got a team set for a long run." 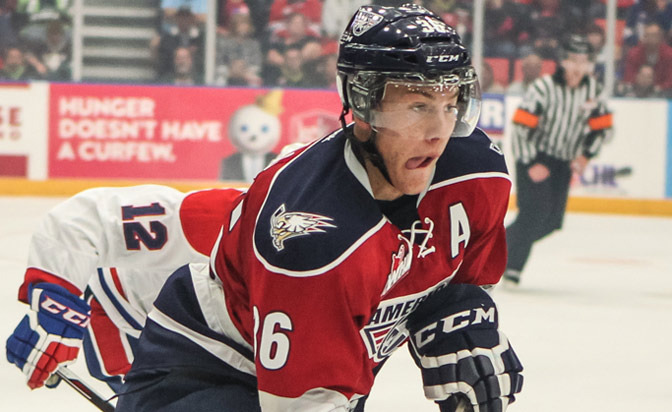 The bureau identified eight A-rated prospects from the Western Hockey League, five from the United States Hockey League and nine players from Europe. In the WHL, Seattle Thunderbirds center Mathew Barzal (5-foot-11, 175 pounds) might be considered the best of the bunch. Barzal has seven goals, 18 points and a plus-1 rating in 16 games for the Thunderbirds. "He's the best skater I've seen out here in terms of his east-west game while creating time and space with his feet," NHL Central Scouting's John Williams said. "He's kind of Paul Coffey-esque. He has great vision and puck skills, makes plays and is the team's No. 1 center. I think he'll be more of a playmaker when he reaches the NHL, but he's an every-situational guy." Two of the top five players from the USHL play for the United States National Team Development Program Under-18 team: left wing Jordan Greenway (committed to Boston University) and center Colin White (Boston College). Waterloo Black Hawks teammates Thomas Novak and Brock Boeser, and Youngstown Phantoms forward Kyle Connor were also identified. Novak (University of Minnesota), Boeser and Connor (University of Michigan) were named to the United States Junior Select Team that will compete in the 2014 World Junior A Challenge in Kindersley, Saskatchewan, Dec. 14-20. There are a number of players who went undrafted last year that are currently trending upwards, Marr said, including Moncton Wildcats right wing Vladimir Tkachev. Tkachev, who is a B-rated skater on Central Scouting's November players to watch list, was No. 60 on the bureau's final list of draft-eligible skaters in North America for the 2014 draft. Tkachev has four goals and 16 points in 13 games for the Wildcats this season. "There's been an increase in the number of 19-year-olds being drafted in recent years," Marr said. "They may not be first-round candidates, but as the season goes on there will be more 1995-born and 1996-born names appearing on our list and the NHL teams are thinking along the same lines." Among the players identified as A-rated prospects from the international leagues, four are competing in Czech Republic: forwards Michael Spacek (Pardubice), Lukas Jasek (Trinec) and David Kase (Chomutov) and goalie Daniel Vladar (Kladno). "Spacek is a hard worker with a good skill set," NHL Director of European Scouting Goran Stubb said. "He makes good decisions, is a smart passer and playmaker. He's an all-around player with a nose for the net." Spacek, who has two goals and seven points in 17 games for Pardubice this season, is a strong candidate to be representing his country at the 2015 WJC. Stubb also identified four A-rated players from Sweden: right wing Jens Looke (Brynas), defensemen Oliver Kylington (Farjestad) and Jacob Larsson (Frolunda Jr.) and goalie Felix Sandstrom (Brynas Jr.). Kylington (6-foot, 180 pounds) might be the next best find from Sweden on the back end. "He's a talented first-round prospect, playing in his breakthrough season with Farjestad," Stubb said. "He's an excellent smooth skater; an offensive D-man with good vision and playmaking skills. He also has very good hand-eye coordination and is dangerous on the power play."